These colorful flowers would love to grace any wall in your house, classroom or office. I think it would look great in a family room, bedroom or even your kitchen. Have a friend who loves flowers? This would make a great birthday or Christmas present. The flowers have been crocheted in pieces and hot-glued onto a canvas frame. It's 3D and so pretty! And just in time for spring. This would be a perfect any time gift. It would make a wonderful addition to a crafter's room or office. Looking for something unique for Mother's Day? These flowers will last for much longer than real flowers! The frame measures 14 inches by 11 inches. It would be a great gift for a baby shower for a little girl's room or a fun housewarming present for a den. If you love this art, but would like the flowers to be in different colors to match your decor, just let me know and I'll be happy to make an order just for you. This is a made to order item. Please allow me 2 to 3 days to complete your decor before it is mailed to you. I think all pink would be beautiful in a baby's room or even a white, gray and black design would be gorgeous! Please note that the colors of your buttons and flowers may be slightly different depending on the availability of yarn, but will be very close to the original art. Please take a look in my shop for baby items and many other great Christmas gifts. 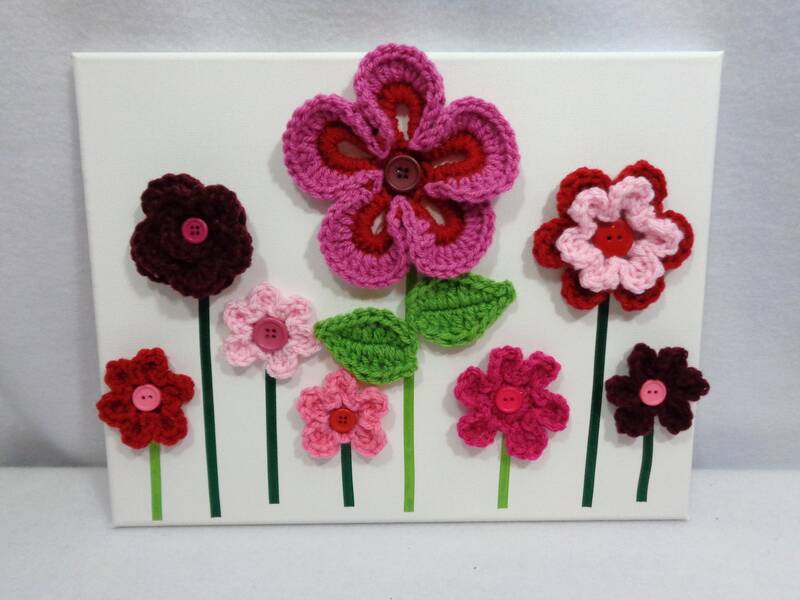 The pattern for the flowers can be found in this great shop!